THE glorious architecture of Sherborne Abbey and its fine artworks from across the centuries, including Marzia Colonna’s 2004 sculpture of St Aldhelm, provided the perfect setting for an illustrated talk by the Bishop of Salisbury, the Right Rev Nicholas Holtam, on the opening day of the 2014 Sherborne Abbey Festival. 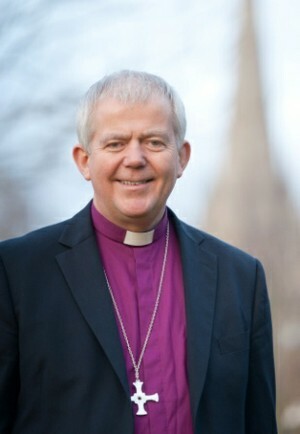 The Bishop’s talk on The Art of Worship, taking its title from his 2011 book, explored the power of art to communicate ideas of spirituality and christianity. About a third of the paintings in the National Gallery have a religious theme or tell a story from the Bible or gospels, and Bishop Nicholas illustrated his talk with well known and less familiar paintings from the gallery’s collection, mainly from the Renaissance. They included Caravaggio’s The Supper at Emmaus, Bassano’s The Good Samaritan and Michelangelo’s The Entombment. Describing Adam and Eve, painted around 1520 by Jan Gosseart, he described the book of Genesis as a story of “what it means to be human” and talked of the humanity of the man and the woman, and the way they showed their shame at picking the forbidden fruit. Posted in Reviews on 2 May, 2014 .